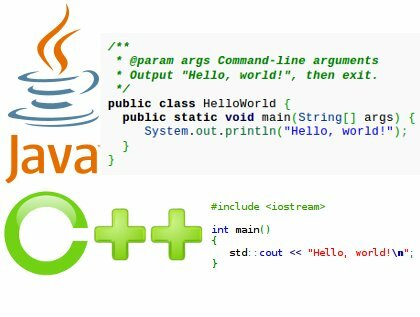 Hello guys, Today I am going to discuss "Difference Between C++ and Java - Java Advantages over C++". Previously discussed difference between C and C++. 1. Write once, compile anywhere Write once, run anywhere / everywhere. Full support to Platform Independency. 2. C++ supports operator overloading for almost all operators. Not supported by Java ,the (+) and (+=) operators are automatically overloaded to concatenate strings, and to convert other types to string in the process. 3. C++ supports complex pointer concept. Java does not support pointers. 4. An array in C++ is not bounds checked. An array in Java is bounds checked, but with extra runtime cost. 5. C++ full support to Multiple Inheritance concept. Java not direct support to multiple inheritance but implements by using interface concept. 6. Compatible with C source code. Not compatible with previous language like c,c++. 7. C++ does not support interface concept. Java supports interface concept. 8. Scope resolution operator supported by C++. Not used in Java. 9. Structure and Union used in C++. Not used in Java. 10. A class definition in C++ has a closing semicolon(;). A class definition in Java looks similar to a class definition in C++, but there is no closing semicolon. 11. C++ supports destructors concept. Automatic garbage collection (can be triggered manually). Doesn't have the concept of Destructor. 12. C++ supports templates concept. Java does not support templates. 13. C++ supports GOTO statement. Not supported by Java. 14. C++ is more complex than Java. It is simpler than C++. 15. C++ doesn't have automatic garbage collector. In Java memory management through automatic garbage collector.